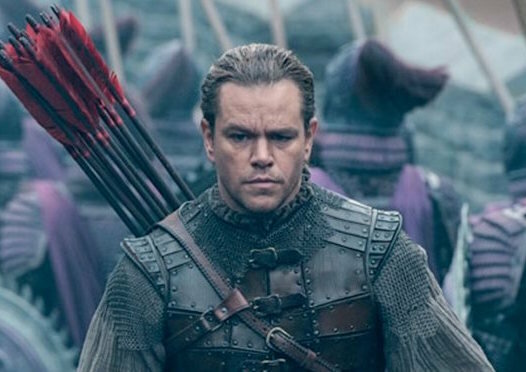 Last week, a teaser trailer was unveiled for the upcoming film The Great Wall. Now, before I get on with the rest of the opinion piece, I want to make it clear that I fully expect that this will be a great film. One of my favourite directors of all time - Zhang Yimou - is directing it, and if it is even a patch on the quality of the likes of Hero and Curse of the Golden Flower, then it will be one of my favourite films of the year. But it is - at least from what we can tell from the trailer - also quite clearly racist, and we need to recognise that. Just as we can appreciate writers like Lovecraft through their racism (and there have been many great, racist, writers over the years), the involvement of American producers and money looks like it has made The Great Wall into one of the most extreme examples of whitewashing that we've yet to see from blockbuster cinema. When a mercenary warrior (Damon) is imprisoned within The Great Wall for attempting to steal the secret of gunpowder, he discovers the mystery behind one of the greatest wonders of our world. As wave after wave of marauding beasts besiege the massive structure, his quest for fortune turns into a journey toward heroism as he joins a huge army of elite warriors to confront this unimaginable and seemingly unstoppable force. The problem is that The Great Wall is, effortlessly, China's greatest cultural and historical icon. It is instantly recognisable as Chinese, it is exclusive to the Chinese, and it holds deep meaning to the Chinese. And they made a movie in which The Great Wall is the key hook all about a white man. It's not just that Damon is there in the film he is the entire driving force behind it. And it's not like China lacks for talented actors - The Great Wall has some of the country's greatest working in it. But they're all pushed to the side so Damon can be the real hero. Not allowing the Chinese to be the starts in a film about their most precious cultural icon is whitewashing, and it needs to be recognised for that, regardless of what your other feelings are about the trailer. I've had a couple of discussions on social media since the trailer landed, and I wanted to quickly address them, as I would expect them to be the most common counters to people highlighting the whitewashing. It's true. The Great Wall is a fantasy film with dragons and stuff and is not based on historical events. But it's also not the point. The point isn't that it is unrealistic, the point is that that they made a film about a Chinese cultural and historical icon all about a white man. It is quite clear from the trailer that two things are happening with this film - firstly, Matt Damon are the heroes of the piece and will be doing a lot of saving, because the Chinese do need strapping white men to come in and save them, and the massive army that we see in the trailer would be lost without the involvement of a couple of foreigners. Secondly, that in a practical sense all the other roles in the film will be supporting Damon. This isn't a film about an ensemble. It's a film about one. And because that one is white, he's pushing all the other Chinese actors to the periphery, which is what the word "whitewashing" describes. Explicitly. 2) But it has a Chinese director! Indeed. And it is shot in China, and has the financial backing of the Chinese government (this is an indication that the problem is more with the trailer than film; more on this in a second). But it's also a Hollywood production, being driven principally by Legendary Pictures, and it's not coincidental that this is the director's first English-speaking film. I'm not suggesting that the team went out with the intention on making a racist film, but I would bet a lot of money that the following scenario is close to the truth: The producers and financiers at Legendary decided that it was necessary for a "Hollywood talent" to lead this film, in order to maximise its commercial potential, and then insisted that the screenwriters make this a Matt Damon film, that would keep him firmly in the spotlight from start to finish. It's not intentionally racist, but casually, it is very much so. We've seen this kind of thing before: The Last Samurai was, explicitly, these same forces at work. Now, The Last Samurai was a film that was respectful to the Japanese, and I've got no reason to think that The Great Wall will be insulting to the Chinese. However, that's not the issue. The issue is in the making a film about China about a white guy. Or to put it in another way: the idea that a film about China can't be successful as an international blockbuster unless it's led by a white person is an acknowledgement of a culture that remains imperialist and uninterested in seeing or experiencing things that aren't contextualised by whiteness. With all of that said, this film is being made with oversight from the Chinese government, and that government maintains a healthy appetite for both censorship and propaganda. For that matter, Zhang Yimou's films have, in the past, been explicitly pieces of propaganda and he's clearly happy working within and to those constraints. Because of this, there is every chance that the end film will be far less extreme in its whitewashing than the trailer suggests. Which doesn't forgive the trailer - it's going to be textbook whitewashing regardless of the end film - but I certainly hope that is the case, because in every other way, this is shaping up to be a really beautiful film.